Cuttin’ a rug is easy in Wisconsin. There is a plethora of dancing clubs for all musical tastes in the surrounding areas. 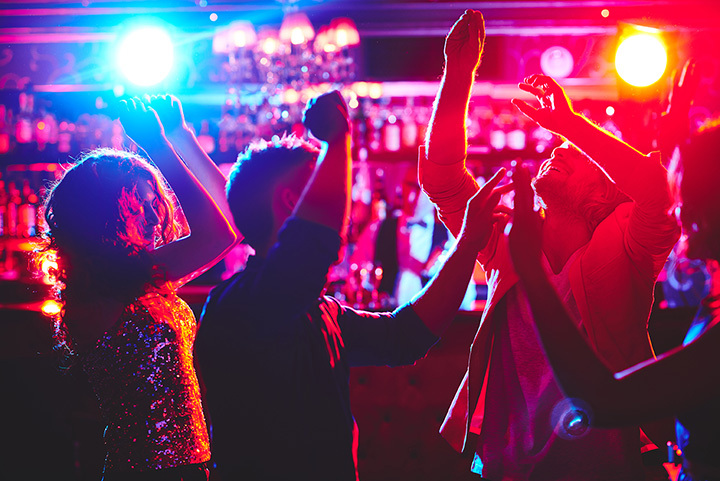 From electronic dance clubs to country music saloons, we’ve got just the thing for you. Check out these nine hottest dance clubs in Wisconsin, and don’t forget those dancing shoes! The dance atmosphere at Liquid is defined by who is performing that night. Not only do they bring in the best names of EDM and hip hop, the night is topped off with an impressive light show, drink specials, lounge, and the occasional messy confetti. Not only is Hot Water a popular millennial dance club, they offer salsa lessons and have Salsa Dancing Saturday. Swing dancing takes place at Hot Water at least once a week too. No partner, no problem come dance the night away in one of Milwaukee’s most popular dance venues. The Reef Nighclub is Wisconsin Dells go-to dance scene. There ocean-themed club offers four different bars, a VIP section, and of course a lively dance floor on any given night of the week. They have themed nights and giveaway throughout the weekends to keep you and yours dancing all night long. Mad Planet is another Milwaukee favorite dance club. Located conveniently on Center St., the dance club is hoppin’ on weekends. Their quirky electric ambiance draws in all types of people on Friday and Saturday nights. Whiskey Jacks Saloon is a high-energy bar and dance club. They have a huge dance floor area and a sectioned off DJ stand to get the tunes going. Grab a partner and dance the night away to all types of music in one of Madison’s favorite dance clubs. If you want to experience an upscale, fast-paced night club in Milwaukee, JYNX is the place to be. While drinks and bottle service for VIP can be expensive, treat your friends and yourself to a night on the town. The DJ and large dance floor will keep you moving and grooving all night long. Red Rock Saloon hosts some of the best names of the county music world as part of their live music Fridays. On any given weekend, their quick tempo hottest country music will get anyone from your group to get up and dance. For a change of scenery ride their mechanical bull or grab a bite to eat before the crowd hits. If you and your friends are looking for an unconventional night out, Club Anything is the place to go. The inside is dark and dank, with an even mixture between Halloween and industrial inspired décor. The dance floor is relatively small so get out there early. Show up on any given event night and have the time of your life. Both armatures and veterans can swing the night away at Jumpin’ Jive. Take lessons, free dance, or spectate from their bar area–people come from near and far to enjoy this swing dance club. View more Wisconsin Dance Clubs.